We love our boats. Clidive Blue is 6.5m with a 200 HP engine and Clidive Yellow is 7m with a 225 HP 4 stroke engine. They are both highly specialised custom built Rigid Hull Inflatable Boats (RHIBs) that can comfortably accommodate eight divers with two cylinders each. This allows us to stay out all day while doing expeditionary diving. 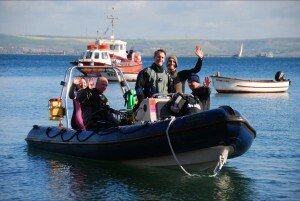 Both boats are lovely to drive and all members once suitably qualified can take them out diving. All the courses you need are regularly taught in-house at low prices. Check out boat handling. 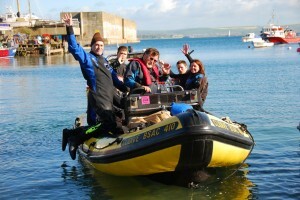 The boats are kept in various parts of the country at different times of year which allows us to dive all over the UK. We also regularly take Clidive Yellow down to the south of France.